From our base in Point-à-Pitre, plot your course south to some of the most untouched islands and amazing rainforest that the Caribbean has to offer. 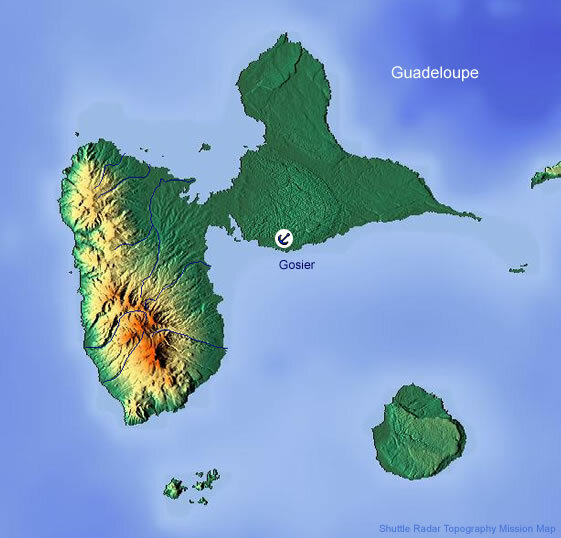 The south coast of Guadeloupe and the island of Marie Galante provide an off-the-beaten-path cruising area with plenty of secluded anchorages. Also called the "island of a hundred windmills," Marie Galante is filled with simple rural traditions, stunning countryside, white sandy beaches, and lagoons protected by coral reefs. Be sure to visit the Grande Anse factory, which launches its 100 days of sugar cane harvesting each March and taste theTi punch - a local rum drink sweetened with cane syrup. You’ll find this beautiful natural anchorage on the northern part of Dominica, located alongside the picturesque Prince Rupert's Bay. Just north of Portsmouth is the twin-peaked Cabrits National Park, its primary point of interest being the ruins of Fort Shirley. Some of the ruins have been partially reconstructed; others are half-hidden in the jungle and are fun to explore. And the views of Prince Rupert Bay are breathtaking! Blessed with timeless beauty, Dominica is one of the most lush and undiscovered islands in the Caribbean. It is renowned for some of the best dive sites in the world, as well as a top-rated whale watching location. Dominica is also home to the largest ‘boiling’ lake in the world, sulphur springs and fertile rainforests with majestic waterfalls throughout. A perfect place for bird watching, hiking, diving and exploring a unique, rich and diverse culture. 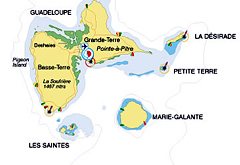 The peacefull sparsely populated islands comprising the Îles des Saintes offer a charming welcome to visiting sailors. Joined to the mainland by a tourism project in the 1970s, Pigeon Island is a mountainous point of lawns and forest. There are historic barrack buildings and many old stone fortifications, some restored but many in ruins. 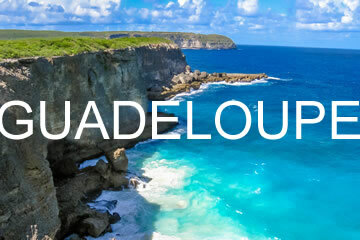 Find time to dive or snorkel through the undersea walls and canyons of the famous Jacque Cousteau Underwater Park. With its rocks, corals, octopi, multicoloured fish, neon tube sponges and sea fans, Jacques Cousteau rated it one of top 10 diving sites in the world. Enjoy the beach at Gosier and you last day of tropical sun.